Retaining dedicated supporters is essential to sustain and grow nonprofit organizations. However, keeping donors after their first-time donations is a challenge that many organizations face. Some charities are looking to monthly giving programs to help with their donor retention. Programs that allow supporters to automatically give a fixed amount each month to a cause of their choice can give nonprofit organizations a source of reliable income and help cultivate donor relationships. Studies have shown that these programs can also produce more donations than one-time campaigns. Network for Good reports that monthly donors give 42% more in one year than one-time donors. Determine whether a sustainer program is right for your nonprofit. Lay out a smooth system to follow. Get ready to change behaviors. Offer multiple levels of giving. Show them the impact of their contributions regularly. Despite all the benefits, many nonprofits rely on the immediate ROI of a large one-time donation over smaller recurring gifts even if the overall amount donated is less. As Alia McKee, Principal at Sea Change Strategies explains: “Too often organizations don’t recognize the tension between lifetime value and immediate budget goals. They want a sustainer strategy to increase their donor pool’s lifetime value, but they don’t want to sacrifice immediate revenue in the door. To ensure you’re going to achieve lifetime value from your sustainer program, check out Alia’s tips on Network for Good. For nonprofits, a donor management system on the back-end that can automate the signup process, track user contact data and process payments is essential. On your monthly donation page, simply describe what your recurring program supports and how individuals can join. The program should be explained well with compelling stories and imagery, while also simplifying the signup process. 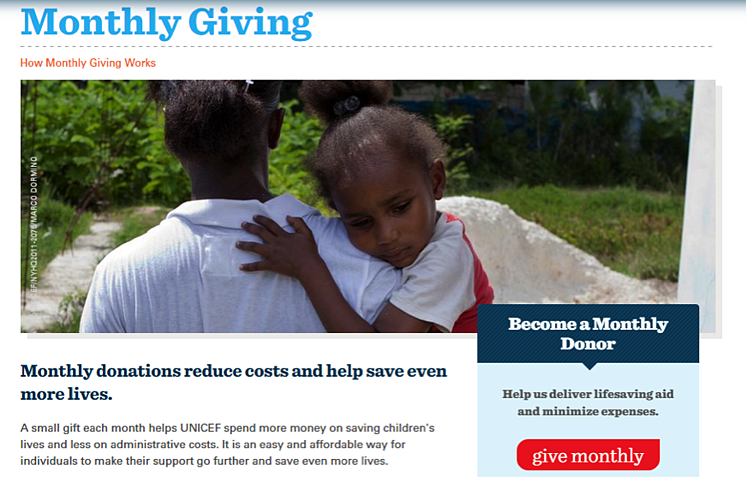 Unicef captures all of these aspects in their monthly giving program. They also layout how the monthly gifts will be used and benefits of joining the program. You should also consider that you’ll need to change (or upgrade) the giving behaviors of your existing supporters. Folks who are used to making one or two single gifts each year toward specific fund drives need to be convinced that a recurring donation is the right investment. It’s easier to convert one-time donors into lifetime recurring donors, if you know where to find them. Use list segmentation to identify existing donors who give frequently (more than three times in 12 months) and recently (in the past 1-3 months). Don't forget to consider your most active advocacy campaign supporters! Individuals who regularly engage with your online petitions and targeted actions make great candidates for recurring giving. Create a segment of supporters who are completely comprised of your nonprofit's most ardent advocates. Then, reach out to this specific segment for recurring gift opportunities following the next time they engage with your advocacy campaigns. Using a constituent management database, organizations can identify which constituents are more likely to be interested in joining a monthly giving program. For instance, an organization’s large gift donors may not be interested in a monthly giving program and would rather give in one lump sum. However, individuals that give at lower levels may be more interested in participating in a recurring program and giving smaller amounts each month. When asking constituents to join your program it is important to narrow your target audience into those that would be most comfortable giving on a recurring basis. Even if users start out at a small level, if that relationship is cultivated well, the level amount may be raised over time. Plus, monthly donors are valuable to your organization in other ways. Besides simply donating to your organization, long-term donors are more likely to be involved in events and volunteer opportunities. This is why it is important to offer different levels of giving to monthly donors as well. Even though they are automatically giving to your cause each month, it is important to give them the flexibility to change the amount. It is also important to be transparent and share with them exactly where and how the funds will be used for each respective giving amount. 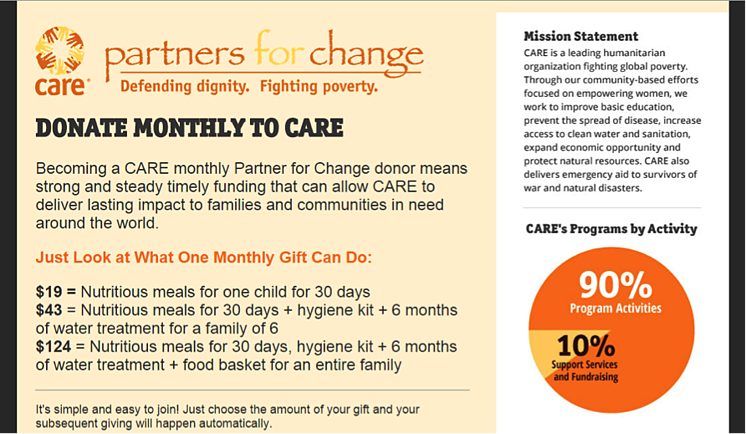 CARE's monthly donation page not only provides different levels of giving, but it shows how each amount will contribute to their cause. This helps potential donors see that each amount has a specific role in making a difference. Monthly donors might be more involved with your organization on a regular basis, so make them feel special. Nonprofit organizations can do this by adding some type of membership or exclusive community aspect to monthly givers or by holding specific events. 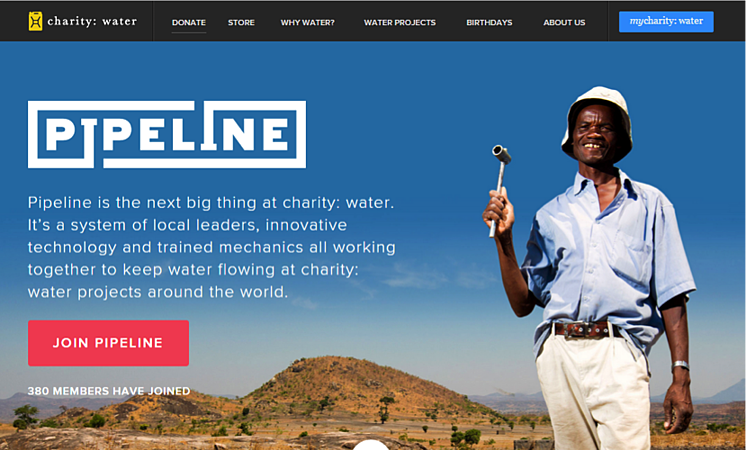 Charity:water has its own community called Pipeline that is completed focused and dedicated to monthly donors. Since monthly donors are automatically and regularly donating to your cause, you likely won’t be sending them messages soliciting another donation. However, that doesn’t mean that you should not communicate with them. It is imperative to show them the impact of their contributions on a regular basis with images, stories, statistics and other concrete examples. This goes back to the earlier point about lifetime value, a key success metric for sustainer programs. Measuring the success of your program is going to be a little different. Gift upgrades. For example, if you run a campaign at the year-end to encourage existing recurring donors to increase their donation amount from one tier to another, measure the net result in terms of responses. Monthly donors are a valuable asset to today’s nonprofit organizations. They fall into a unique category of supporters and should be approached with strategic and personalized messaging. Creating a successful monthly giving program can be challenging, but by forming a lasting relationship with dedicated donors that continuously support your organization, it is worth it.